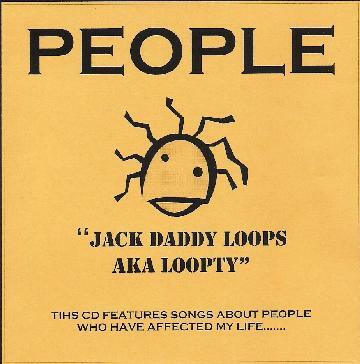 Jack Daddy Loops AKA Loopty - "People"
Jack Daddy Loops AKA Loopty (aka Barry Greenberg) follows up 2 volumes of tributes to his fellow business men and women on Main Street in Brockport, New York with a tribute to the people who "have made a huge impact on my life". Barry gives us a little insight into his life, with instrumentals dedicated to his sister, parents, a few women "who stole my heart", and other special friends. "Debbie" opens with an acoustic guitar strumming pattern that is soon replaced by metallic electric guitar playing a crunchy version of the same pattern, and accompanied by alien electronics, a light electro-pop keyboard melody and piano. I liked the contrast between the rockin electric guitar and keyboards. And this extra dose of Rock was most welcome, given that I closed my last Jack Daddy Loops review with a wishlist request for some more heavy rock. "Bailey" is similar but with a New Agey vibe too. Barry keeps things interesting on "Duane" as he incorporates metallic rock, funk rock, freaky space sounds and more. I especially liked the jamming funk rock bit and would love to hear him focus on that for a whole tune. "Aubry" takes us into trademark Jack Daddy Loops territory, as he plays around with some simple but nicely varied funky and freaky electronica ideas. "Nat & Jules (R.I.P.)" and "Brenda" are each part meditative deep space electronic journey and part alien dance party, combining all manner of dance beats, hip-hop and ambient space. Real cosmic toe tappers. Barry typically does a good job of skirting back and forth between various styles, but while it makes for fun and interesting listening it can come off as being a bit disjointed. And in that regard the last two tracks are a bit different. For pure deep space dance fun, "Sharron & Richard" is the best and probably strongest track of the set, and is a standout for being focused and cohesive while still including lots of variety. And finally, "Laurie" is a slow, cool, space ambient, electro jazzy, beat driven alien groove tune. Very nice.